This month I am on time with my post, so what were my "faves" in February? 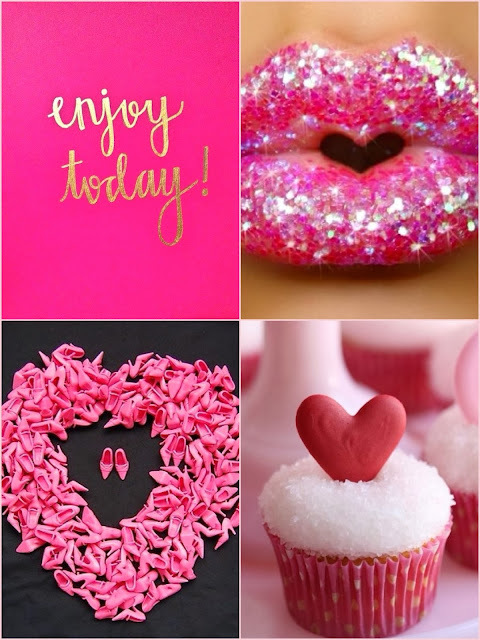 I just love cupcakes, in fact I love any type of cake and I really do admire these creative bakers who can ice and decorate. 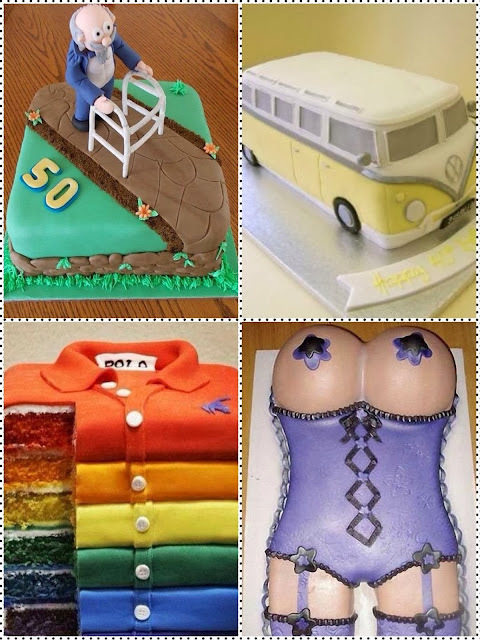 Here are some wonderful cake ideas for the men in our lives...check out the attention to detail. 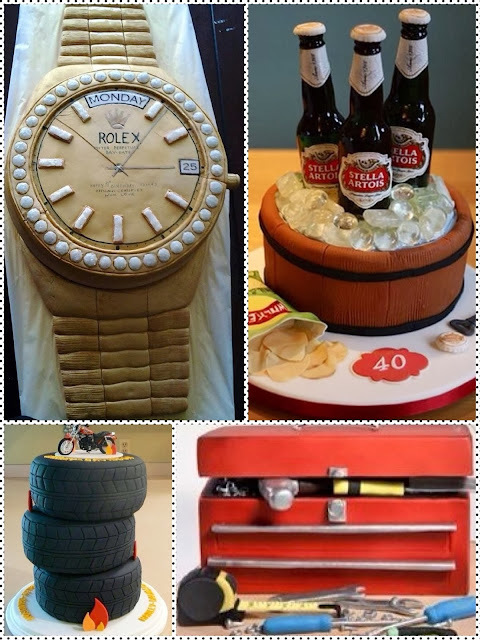 My "faves" have to be the Rolex watch and the Stella Artois,which are yours? 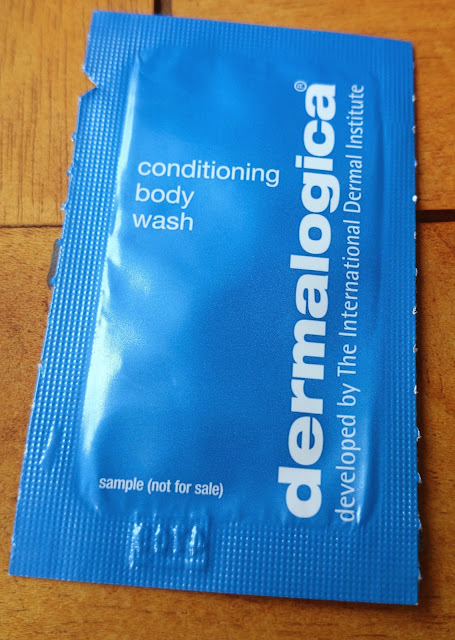 Last week I pulled out of my sample jar a sachet of dermalogica's Conditioning Body Wash. This body wash forms part of their Body Therapy System. The range consists of several products i.e.Exfoliating Body Scrub,Hydrating Body Creams,Hydro-Active Mineral Salts and a Stress Relief Treatment Oil, which enables you to really create and customize your own aromatherapeutic spa experience in the comfort of your own home. 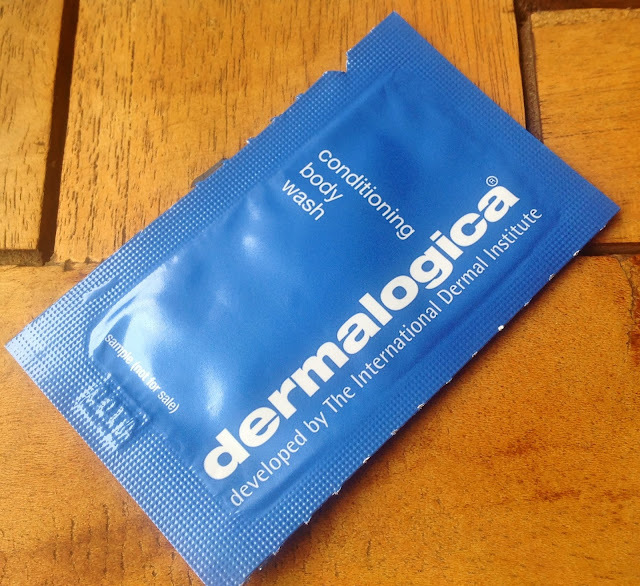 Upon opening the sachet you can smell the Eucalyptus and Rosemary essential oils, which instantly took me back to my college days where we used to mix our own massage oils depending on the needs of the client. Many home Spa products claim to capture the essence and recreate that Spa experience at home and this product alone did that for me, as it really did smell like a Spa in a bottle, or should I say in a sachet. You instantly feel the richness of this soap-free botanical cleansing gel, as it lathers into a nourishing cleanser and after rinsing off leaves your skin feeling clean without feeling tight. I don't suffer from excessively dry or dehydrated skin, so I unfortunately cannot say that I felt any noticeable benefits from the Pro-Vitamin B5, which helps moisturise the skin and leaves it feeling soft and silky. The inclusion of Tea Tree, Lemon, Eucalyptus and Rosemary essential oils will all help to gently purify without stripping the skin’s own natural moisturisers. The soothing essential oils of Sandalwood, Lavender, Orange and Clary Sage help condition and smooth. This product is great for anyone who is looking for a soap-free all over body cleanser.It's also formulated without artificial fragrances and colours. I would say it's a must for anyone who suffers from very dehydrated, dry or sensitive skin especially when changing seasons in the Northern Hemisphere,where body washes can cause further dehydration of the skin. I am now curious to find out more about the other products in the Body Therapy System, as the fragrant combination of all those essential oils has certainly got my attention. 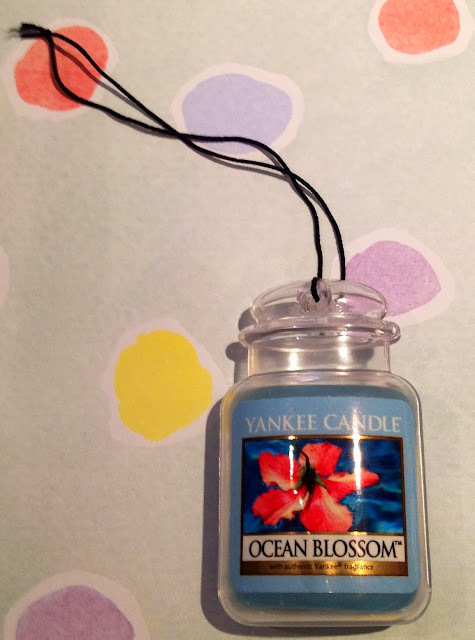 I want to check out if Yankee Candles make it in the tarts and candles. 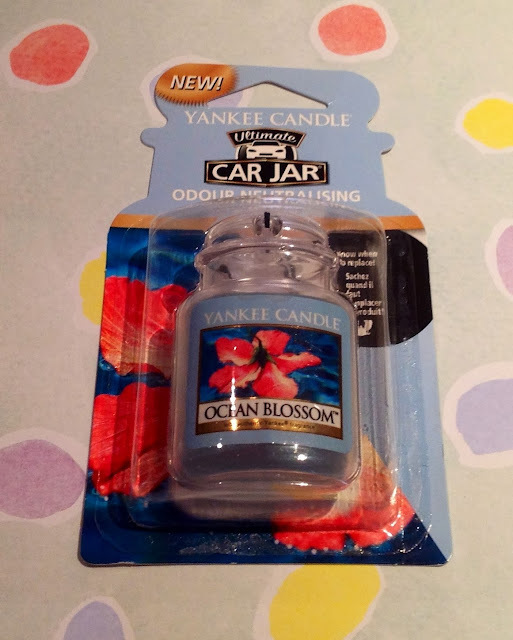 The Car Jars are available in many different fragrances. Launched this month Clarins have developed a customizing correcting concealer which adapts to the tone of your skin. Clarins claim that it effectively conceals those dark circles, thanks to the ingredient Caffeine, but it also contains Aloe Vera extract which smoothes, refreshes and revives the eye area. This treatment concealer contains, Light Optimising + complex, which is a Clarins exclusive. The Instant Concealer comes in 4 shades worldwide ranging from 01-04 and the tints are designed to mask the colour of the dark circle, whilst restoring the skins natural tone. Fair (01) treats bluish dark circles, Medium (02) is preferable for brown/violet dark circles, Medium Deep (03) is for deeper skin tones and is recommended for brown/black dark circles, and Deep (04) is also for brown/black dark circles. I chose the 02 shade and instantly you can feel the ease with application and blending under the eye area, as there is no dragging or pulling on this delicate and fragile skin. 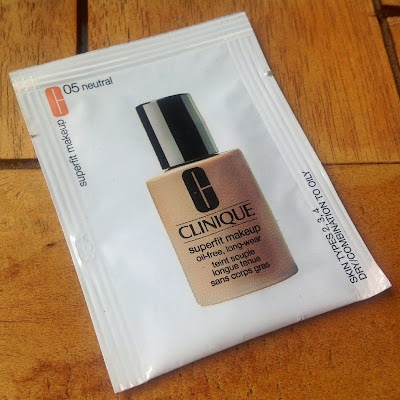 Being a mature user this is important to me, as some concealers can drag as they don't seem to contain sufficient moisturizing properties to give that easy glide. 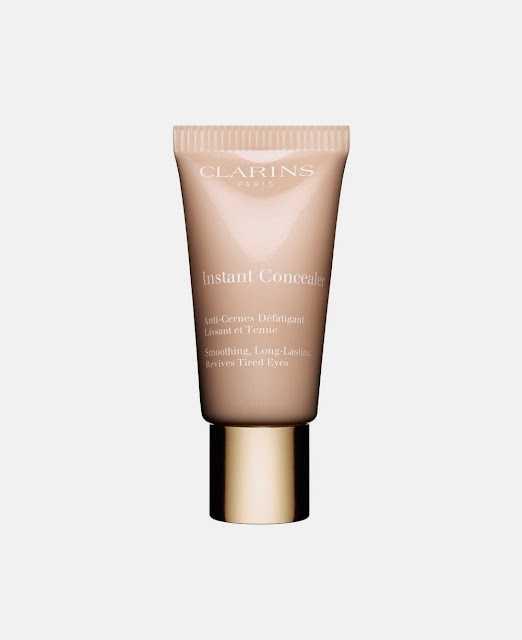 I always use a morning moistirizing eye treatment and then apply my concealer and keeping to this routine the Clarins Instant Concealer worked perfectly and for me it was great to know that the moisture level didn't feel any less at the end of the day than it did at the beginning! However I cannot comment on how it would perform if applied directly to the skin with no prior application of an eye product. 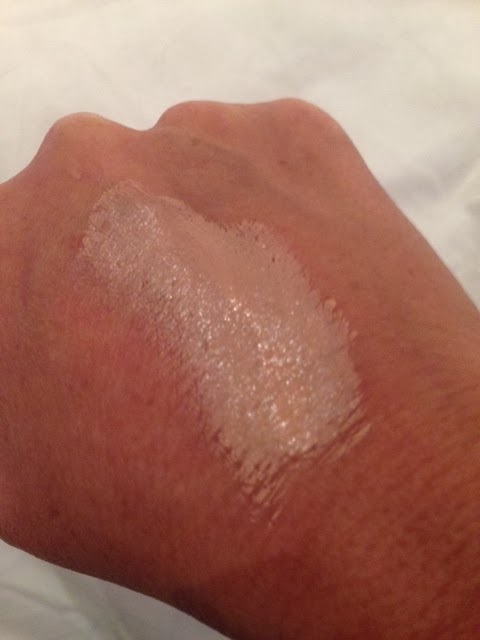 The shade once applied to my dark circles felt light and did cover and conceal well and as you can see from my swatch the shade once blended did change as it corrects to your natural skin tone. I have for many years used an Estée Lauder concealer and have always been very happy with it, but this one from Clarins does take the application and performance of concealing those dark circles and discolouration around the eye area, one step further. I was hoping that the Instant Concealer would be a combination of the Clarins eye gel and a concealer, but in my opinion this product focuses more on the concealing than reviving and refreshing the eye area..I really wanted to feel more of a refreshing and cooling effect. However I did enjoy the effect of the Light Optimising + complex, as I certainly found that my fine lines were softened, giving my eye area a more perky and noticeable youthfulness. Anyone reading this, who is 40+ will understand exactly what I mean by this and the extra light diffusing effect in any product is appreciated at this age! to Clarins for bringing out a product that helps me to defy the aging process a little longer! HOW TO: CLEAN YOUR MAKEUP BRUSHES IN 60 SECONDS!!!! This is a great short video from Wayne Goss where he stresses the importance of keeping those make up brushes clean and free from germs and bacteria all in 60 seconds. This year we decided to go out for a Valentines dinner on the 13th of February rather than on the actual day the 14th....long story, so don't even think or ask why! that opened at the Square in Umhlanga at the end of 2013. 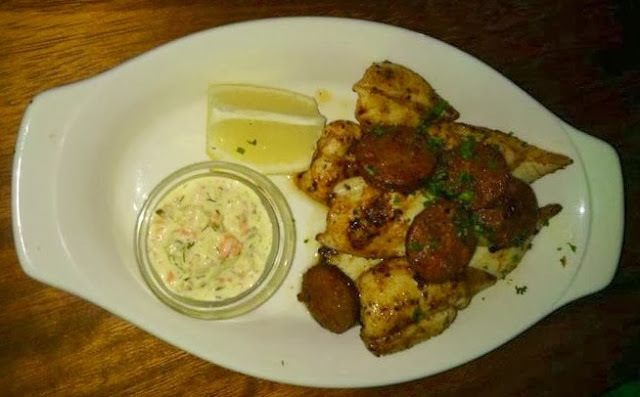 The restaurant is situated inside a small office and retail centre and many of the tables are outside on a wooden deck and it was very pleasant sitting out on a Durban balmy summers evening. Unfortunately this is where any compliments about Aurelia's ends. to be blunt "p----d us off about this place". There were only three or four tables occupied, which I understand to a point, as its the night before Valentines day, but any restaurant that is good, is busy most nights of the week. The first thing I noticed was a distinct lack of anyone to greet us and show us to a table, so we awkwardly seated ourselves outside on the deck. The menus arrived, which were very "tatty and torn", so that didn't create a very good first impression especially as the place has only been open for a few weeks. The food on the menu was the normal Italian fare. The next problem arose with our drinks order, my hubby asked what beers they served and his beer of choice was amongst the many mentioned - Windhoek Draught in a can. After a search the waiter returned to inform my hubby that they didn't have any, which didn't go down too well. Apparently they had ordered but the delivery didn't arrive that day.....which is fair enough, but why allow your stocks to run so low before re ordering? Lets move onto the food..between us we ordered a starter of Grilled Calamari and Chorizo, which was quite tasty but not worthy of "must try again" comment. 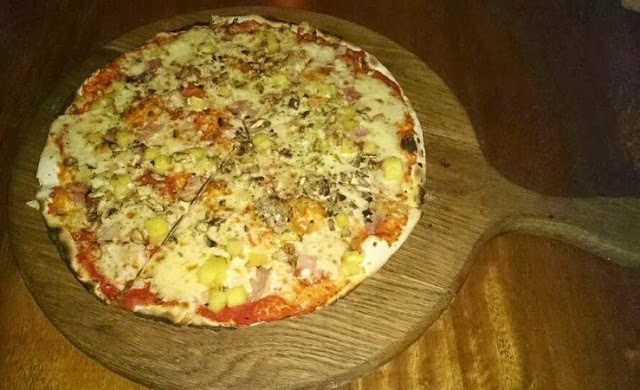 Claiming to be authentic Italian food hubby and I ordered Wood fired Pizzas and to be completely honest my Hawaiian Pizza was very bland, as was my husbands Pollo Piccante Pizza, so much so, that he made good use of the bowls of chilli and crushed garlic that they brought to the table...not a good sign! 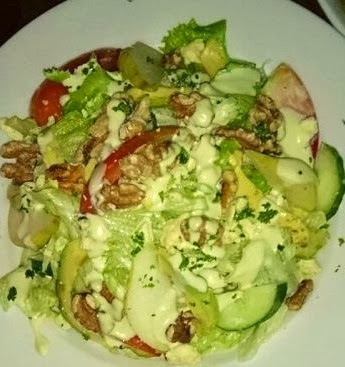 I ordered a small Roquefort Salad at R39 as printed on the menu as opposed to the large salad at R70 ( 2 sizes available for all of their salad options) . The waiter politely informed me that they do not have the small salads...imagine a silence at this point....OK...I was lost for words for a moment or two and then I asked "why is it a problem to do a small salad?" He promptly replied that they do not have the small bowls to serve a small salad!!!! At this point all logic had gone out of the window as I couldn't believe what I was hearing. I ended up ordering a large salad, but again it was an average salad and really nothing to rave about. During our meal the manager passed by our table and asked if everything was good, I had to bring to his attention the debacle with the salad and the beer. He appeared surprised and offered to charge us the small salad price R39 rather than the large price of R70. As you can sense I won't be returning anytime soon, which is unfortunate as it could have been my local Italian. I wonder if those reviews that I had previously read actually ate at the same restaurant or for that matter even paid! This little sample of Dermalogica Conditioning Body Wash slipped past me and ended up in depths of my sample jar. Read my review next Sunday as to what my views on this product are! 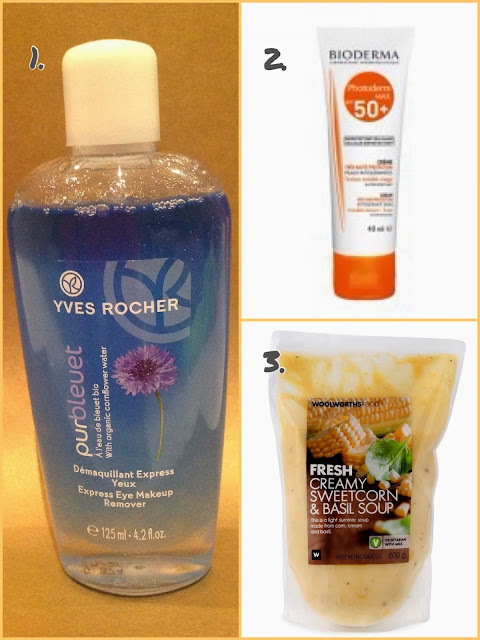 As you maybe aware over the past few months I have been using several products from the French brand Yves Rocher and I have been thrilled with all of them. I recently received a miniature sample bottle of one of their fragrances Moment de Bonheur Eau de Parfum in a free gift. I have to admit that I am somewhat of a fragrance "snob" and that was the main reason that this sample ending up in the jar, the other reason was the packaging. (I have mentioned previously in one of my posts about the packaging of Yves Rocher being confusing due to its mix of colours and it has a distinct lack of appeal for me) I have already found out that this book should not be pre judged by its cover or by its inexpensive price. When I started my Sunday Sample post some weeks ago I agreed that I would use and review the samples that were in my jar no matter what and that's what have I have done over these past Sundays. I honestly expected this fragrance to be a once off wear, then write my review and move on. Well... guess what? I have discovered another little gem. 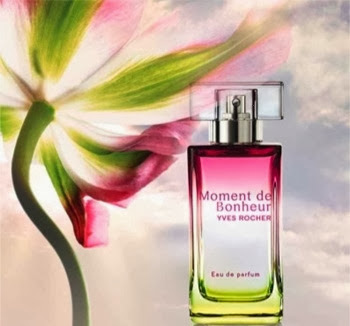 Launched in 2011 Moment de Bonheur translated from French means a Moment of Happiness. and the woodiness comes from patchouli and cedar. I adore the smell of honeysuckle, vanilla and peach, so this fragrance has to be a hit for me and it was! the brand and the price. 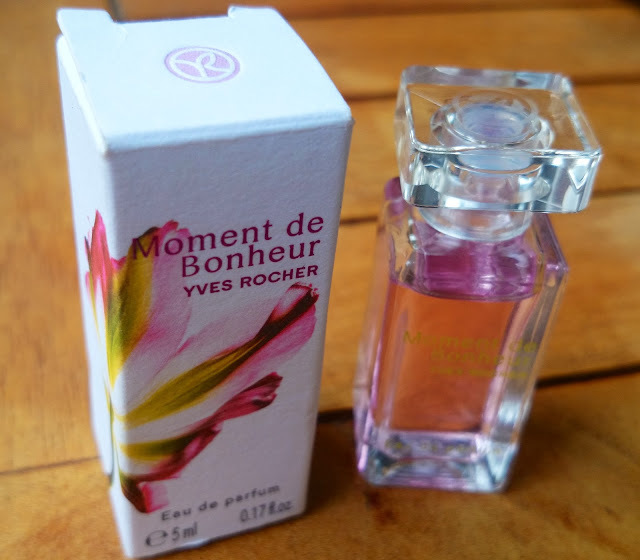 This past Sunday I picked out of my sample jar a miniature bottle of Yves Rocher Moment de Bonheur Eau de Parfum, which I received in a free gift recently. Admission time again...I am quite fussy when it comes to fragrance and this unfortunately joined the jar purely because I didn't like the look of the packaging. You will have to wait until Sunday to read whether it was a "hit" or "miss" with fussy me! 2. Lovers swap saliva containing various substances e.g. fats, mineral salts, proteins while kissing. According to latest studies, the exchange of the above substances can give a boost to the production of antibodies, which are made specifically to deal with the antigens associated with different diseases as they are encountered. 3. As a rule, 66 percent of people keep their eyes closed while kissing. The rest take pleasure in watching the emotions on the faces of their partners. 5. A quick romantic kiss will burn about 2-3 calories, whereas a French Kiss (an openmouthed kiss with tongue contact) will burn more than 5 calories. 7. The bodies of those engaged in kissing produce a substance that is 200 times more powerful than morphine in terms of narcotic effect. That is why the kissing partners can experience feelings of euphoria and bliss in the process. 8. Kissing can help women relax and ease the effects of stress. 9. On the average, a person spends 20,160 minutes (two weeks) of his life on kissing. 10. 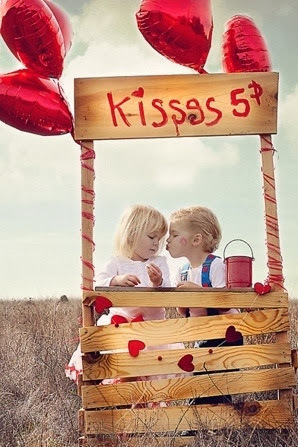 Every other person on the planet has his first amorous kiss before reaching the age of 14. Males...prepare yourself, as this is the week of Valentines Day, which by the way is on Friday. The marketing and the hype surrounding the "gifts of love" and all things "Valentines" steps up a notch or two, when this day falls on a Friday or Saturday, so if you haven't booked that restaurant yet, ordered those roses or bought a gift, you will need to do it pronto. I must say that the trial size of the OPI Avojuice Skin Quenchers Hand & Body Lotion that I pulled out of my sample jar last week, has been a very pleasant surprise. I received this in a goodie bag some time back and I must be honest, it really didn't appeal to me hence it got tossed into the jar. How wrong I was to ignore this little bottle of mango smelling body lotion. The fragrance of Mango is strong, so if you are not keen on fruity fragrances then this may not be for you, there are however floral varieties available like Jasmin,Ginger Lily, and Hibiscus Blossom. The mango fragrance warms as your body warms the lotion and I found it to be very long lasting. Consistency wise the lotion was light, yet I found it to be ideal for the humid Durban summer. The 30ml trial size retails for R40 and is available at Sorbet salons around South Africa. It makes a perfect travel companion as a body lotion and fragrance all in one and I have my eye on the Hibiscus Flower next. Clarins South Africa have a very busy few months ahead and there are plenty of "New" launches coming our way from this Iconic French brand. This Instant Concealer is a multi tasking product that definitely grabs my attention. Launched this week in South Africa, Clarins have developed an instant long lasting customising concealer that also smooths the skin around the eye contour area, whilst reviving tired eyes...after all who doesn't have tired eyes that require reviving? My review on this product will be posted on my blog next week. Even though I am not a "soap n water" kinda girl, I may be tempted to try this product. The key words for me in the name of this product are "Comfort" and "Cream" and having a mature skin, these words definitely speak to me! I don't want to reveal too much right now, but I can't wait to bring you my review on this product next week. I started my "Monthly Favourites" post back in January 2013 and I can't believe that a year has passed by so quickly. 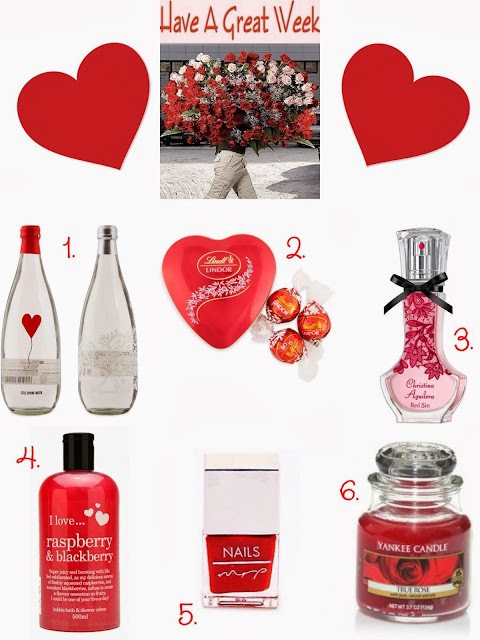 Here are some of my "faves" for January 2014 albeit a little late. This is worthy of being on my monthly favourite list for January. I recently found this Fresh Creamy Sweetcorn and Basil Soup in Woolworths and it is absolutely "delish". It's a lighter soup making it ideal for summer. it really does give you the eyeliner look. 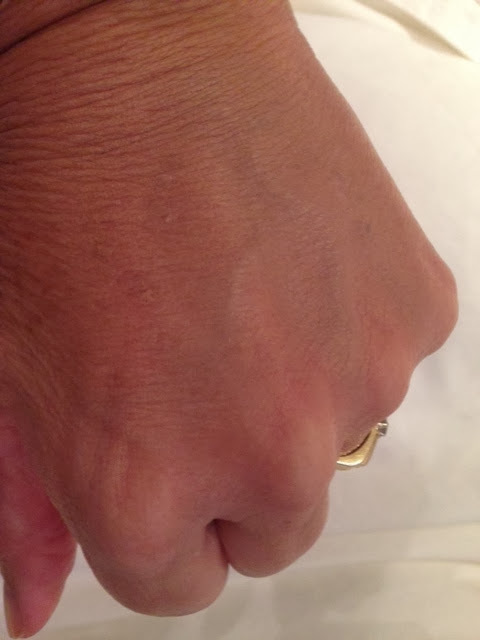 It's great if you don't have a steady enough hand to draw that line on your upper eyelid. Give it a try, as it's so easy. I have to say that I am really enjoying the random dip into my sample jar every week. Hand & Body Lotion - Mango. 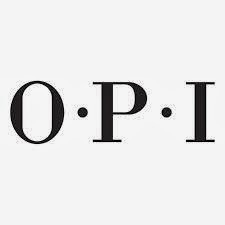 Known for their nail colours OPI do make a selection ancillary products. Watch out for my review next Sunday. 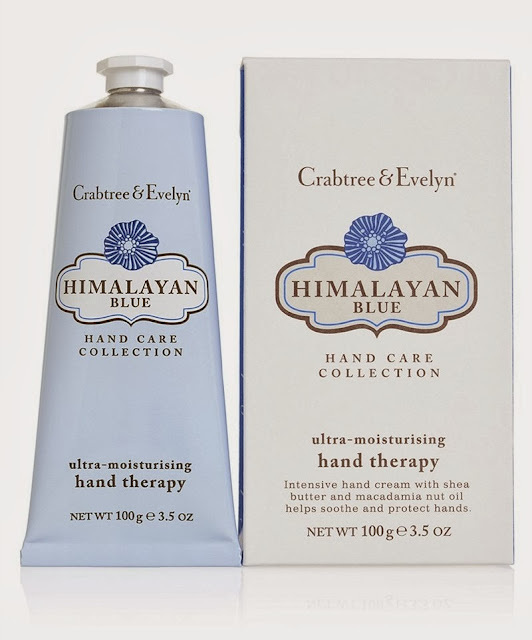 Last week I pulled out of my sample jar a sachet of Crabtree & Evelyn's Himalayan Blue Hand Treatment. The sachet contains 5gs of cream and I found it to be a generous amount, as it kept me going for several days. I am not a daily user of a hand cream as my cuticles and hands do not get particularly dry, but I always carry a small tube or sample in my bag. This also helps ease the need for constant hand moisturizing, combined with the fact that I don't wash dishes or do lots of gardening, both of which take their toll on our delicate soft hands. The first thing I noticed on opening the sachet was the burst of exotic fragrances,which I later discovered was smoked black tea and ginger, which I have to say I enjoyed. Himalayan Blue Ultra-Moisturizing Hand Therapy is infused with macadamia nut oil, shea butter and extracts of golden champaca, ginger and tea oil. As with all good quality products a little goes a long way and this hand cream was no exception. I found the moisturizing levels to be good for me, but I fear that more seriously dry or neglected hands may want to opt for a more intense hand cream with perhaps a higher concentration of Shea Butter, which is wonderful for nourishing and moisturizing extra dry skin. Also this hand cream leaves no greasy residue and iPad work can continue soon after application. It is one of the pricier hand creams on the market, but taking into account my low usage rate it would work for me.